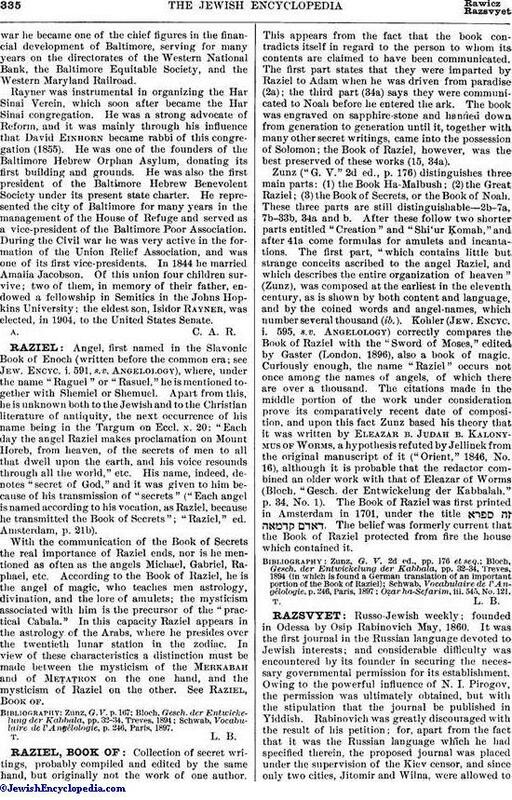 Angel, first named in the Slavonic Book of Enoch (written before the common era; see Jew. Encyc. i. 591, s.v. Angelology), where, under the name "Raguel" or "Rasuel," he is mentioned together with Shemiel or Shemuel. Apart from this, he is unknown both to the Jewish and to the Christian literature of antiquity, the next occurrence of his name being in the Targum on Eccl. x. 20: "Each day the angel Raziel makes proclamation on Mount Horeb, from heaven, of the secrets of men to all that dwell upon the earth, and his voice resounds through all the world," etc. His name, indeed, denotes "secret of God," and it was given to him because of his transmission of "secrets" ("Each angel is named according to his vocation, as Raziel, because he transmitted the Book of Secrets"; "Raziel," ed. Amsterdam, p. 21b). With the communication of the Book of Secrets the real importance of Raziel ends, nor is he mentioned as often as the angels Michael, Gabriel, Raphael, etc. According to the Book of Raziel, he is the angel of magic, who teaches men astrology, divination, and the lore of amulets; the mysticism associated with him is the precursor of the "practical Cabala." In this capacity Raziel appears in the astrology of the Arabs, where he presides over the twentieth lunar station in the zodiac. In view of these characteristics a distinction must be made between the mysticism of the Merkabah and of Meṭaṭron on the one hand, and the mysticism of Raziel on the other. See Raziel, Book of. Schwab, Vocabulaire de l'Angélologie, p. 246, Paris, 1897.